Ripplefisher started from a simple request from a commercial fisherman. There were fish that he couldn’t stop and needed a powerful tenacious rod to help him land the fish. This specially designed rod was Ripplefishers beginning. 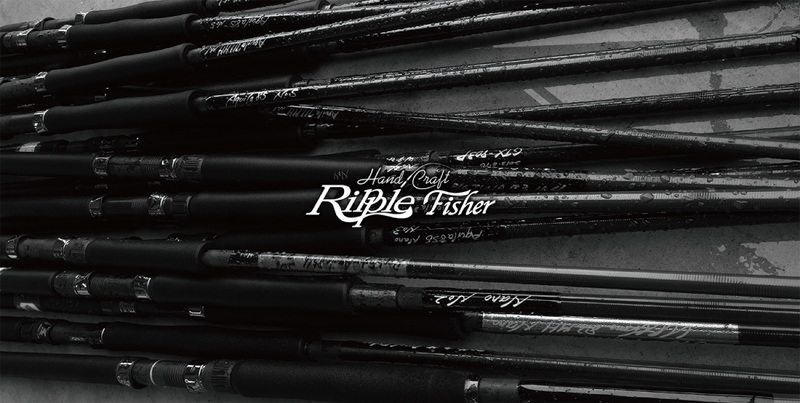 Although the big game fishing in the salt-water scene was not as major as it is today, Ripple Fisher strived to produce deep jigging, GT, and other big game rods. Recently, our product lineup has diversified to seabass, blackfin seabass, and even light game rods for the Aji and Mebaru. Although our product variation may have increased, our fundamental spirit has not changed since the beginning. This is why our theme at Ripple Fisher is to create a “strong” rod. However, not matter how strong a rod may be, if an angler cannot control the rod, the rods true power and potential will not be produced. Each casting process to the final fight of fish has to be comfortable in order for an angler to excrete the rods maximum capacity. The rods true power will only be exhibited with well balanced settings to maintain concentration and when anglers can place trust in the rods blank by loading their whole weight on the rod to fight the monstrous fish on the other end. At Ripple Fisher, we seek and merge together conflicting factors of “specialized performance” and “user-friendliness”. It is a never-ending journey for us to continuously integrate new material and settings to further ourselves in the rod-manufacturing world. We believe that our evolution has been dependent on the needs of our customers and for our users to realize their dreams. Our biggest fulfillment is when customers capture their dream fish while using our rods.